At MSC Meraviglia's handover on Wednesday at the STX France yard, newly-elected French president Emmanuel Macron, said he wants to review (and possibly renegotiate) the agreement to sell a 48% stake of the yard to Fincantieri before the sale is finalized. Macron is concerned that French jobs could be lost or that business that would have been won by the French yard will be diverted to Fincantieri's multiple Italian yards. The complete story appeared in the June 2 edition of Cruise News Daily. 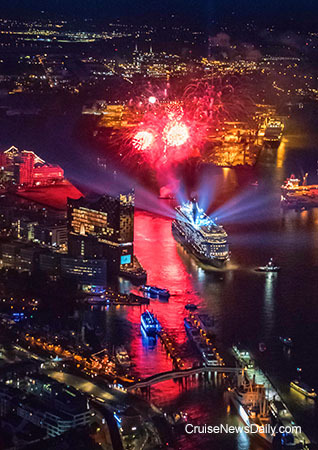 Mein Schiff 6 being christened in Hamburg. Royal Caribbean's Oasis of the Seas will operate a cruise that will put it right under the path of a total solar eclipse. Details appeared in the June 2 edition of Cruise News Daily. When MSC officials were at the STX France yard in Saint-Nazaire on Wednesday, they didn't just pick up their new ship. They ordered two more with options for two additional ones. These won't be Meraviglia clones; they will be the latest in cruise ships: the 2022 World-class model - with the high-tech engine - and whitewalls. As you may have noted by the model year, MSC (and passengers) will be waiting awhile to ride these beauties. The two under firm order will be delivered in 2022 and 2024, with the options being for 2025 and 2026. Rendering courtesy of MSC Cruises. All rights reserved. May not be copied or used without permission. STX France officially delivered MSC Meraviglia to MSC Cruises today at the STX yard in Saint-Nazaire (France), and the handover is marked by the changing of the flags on the ship. The flags of the yard are lowered and replaced by those of the cruise line and the country where the ship is registered. Last week we told you about AIDA's next generation ship which will be powered by LNG and will enter service in December 2018. As we noted, AIDA will begin taking reservations for the inaugural season tomorrow (June 1), but its name had yet to be revealed. AIDA took care of that detail this afternoon when it was revealed during a presentation aboard AIDAperla, which just entered service in the Mediterranean. It was revealed when a banner was unfurled at Meyer Werft in Papenburg (Germany) where the new ship and a sister will be built. The new ship will be named AIDAnova. Costa and its parent, Carnival Corp, are major brands in Italy, and therefore both major employers and impact the country's economy in several ways. And Costa is set to grow in Italy becoming an even larger employer. What If the Ship Isn't Ready? That's something cruisers would often ask when they had booked the first cruise after a dry dock. Lately, it's hardly been an issue because the shipyards have become much more reliable. But passengers booked on Sunday's sailing of Celebrity Constellation found out what happens.